Between my husband and me, he sews the neatest and is not afraid to tackle something new so he made both CAPS using red felt. He didn’t use a template or pattern. Just measured my daughter’s head, cut the felt, and sewed it up! I used the yellow felt and a template to cut out the STAR and my husband sewed it unto the shirt. I made the BELTS with the craft foam and used Velcro with double-sided tape to open and close. I made Captain Huggy Face’s pants and shirt. I didn’t use a pattern or template. 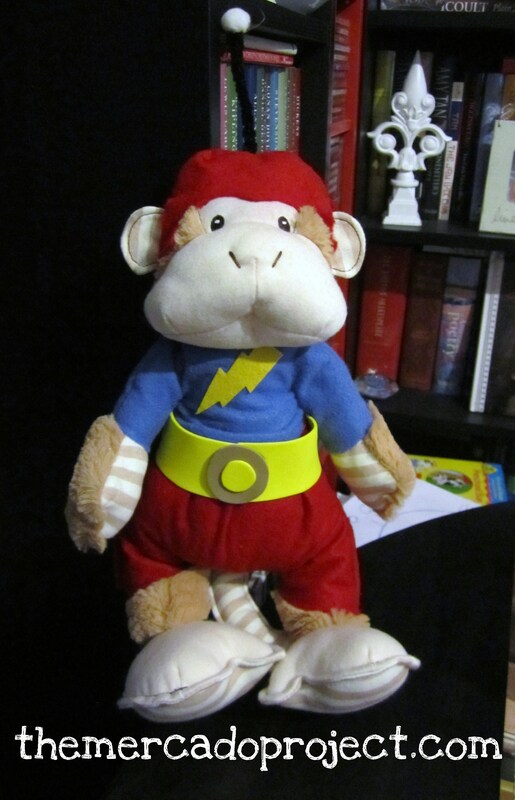 Just sort of measured the felt on the monkey’s body and started sewing away. Unfortunately, this method resulted in the shirt coming out really small, but lucky for me stuff toys can be squished. I squeezed him into that shirt because I wasn’t going to make another one. For the antennae on the monkey’s cap, we used a black pipe cleaner and affixed a small, white pom-pom ball on top. I was trying to find some red or burgundy leg warmers to put over my daughter’s black boots, but I couldn’t find any. I was a little worried that people wouldn’t know who she was dressed up as, but I was worrying for no reason. 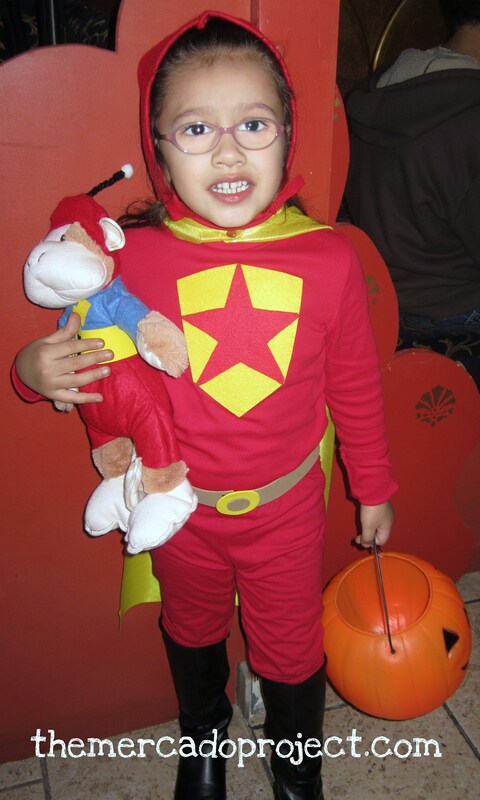 After they came back from trick or treating, my husband told me that every kid who saw her shouted, “Word Girl!” and my daughter couldn’t stop smiling. 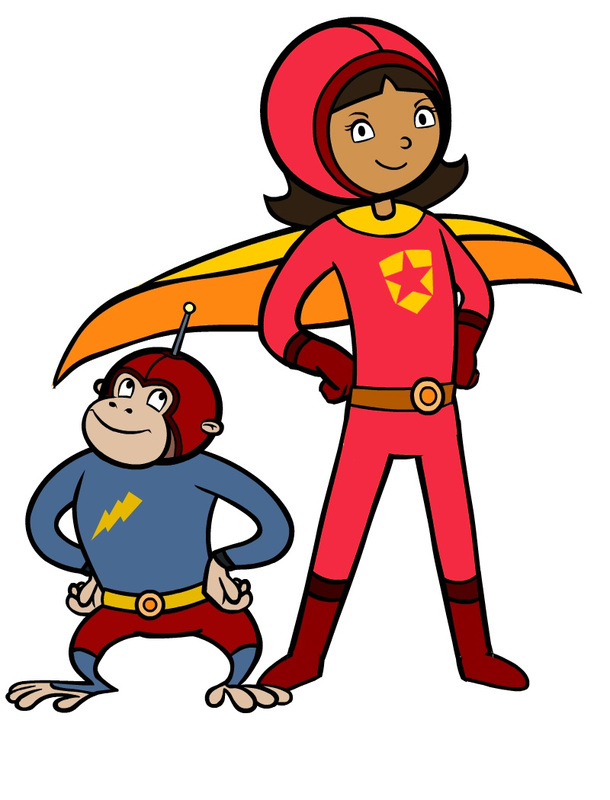 There were even mothers asking, “Where did you get the costume?” at which my husband proudly proclaimed, “We made it ourselves!” 🙂 We had a great time putting this costume together and my daughter’s face, every time another piece came together and she saw herself transforming into Word Girl, was very enjoyable. 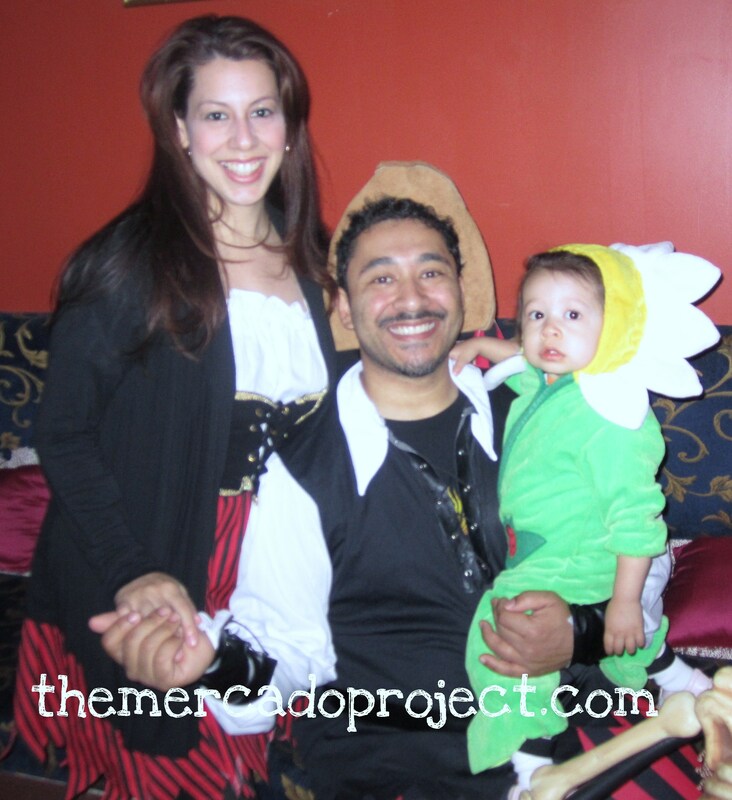 We also went to a Halloween party a few days before and my husband and I dressed up as pirates, which we bought at Party City. I had to make some alterations to my costume because the skirt was too long so I shortened it and the sleeves were too wide so I took them in. 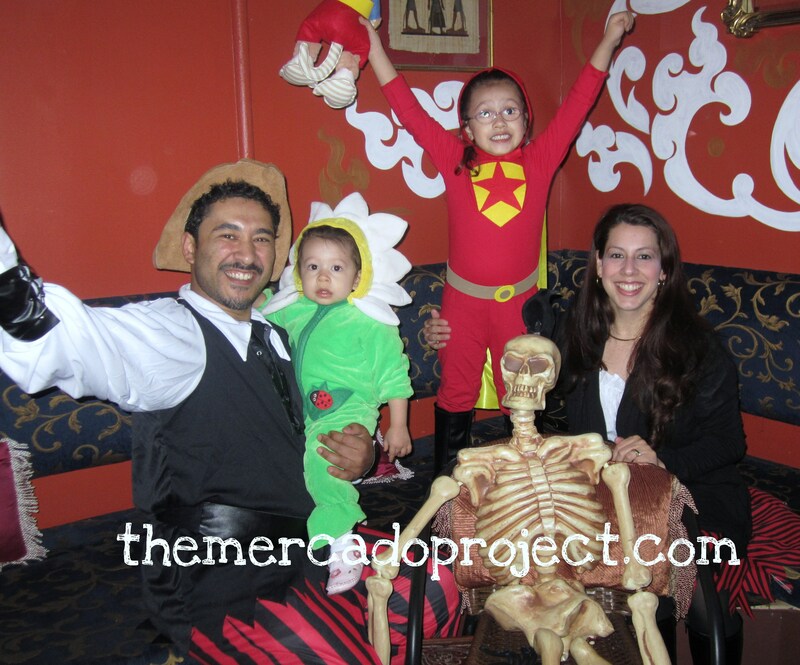 My youngest was a daisy flower, but she fussed nonstop with her costume. Just wondering where you got the template for the star. You guys did a great job! Hi and thank you! I went to google and searched for star template and chose the best star to print on cardstock. After cutting out the star, I placed it on the felt and using a disappearing pen, I traced and cut out the star. I glued it on the yellow shield with fabric glue. Thanks for visiting. Have a great day! Hi and thank you! We used yellow felt for in front of the shirt and a yellow, shiny fabric for the cape. We actually stumbled upon that fabric at the craft store in the clearance area. We got lucky with that one! Good luck and happy early Halloween!! Thanks for visiting my blog. This is fabulous! I am working on a similar costume for my daughter for this year, and I love the detailed tips that you gave — thank you! Thanks for your great comment and for visiting my blog. We had a lot of fun putting this costume together. Happy early Halloween! !